American military involvement would inflame, not ease, Iraq’s sectarian divisions. 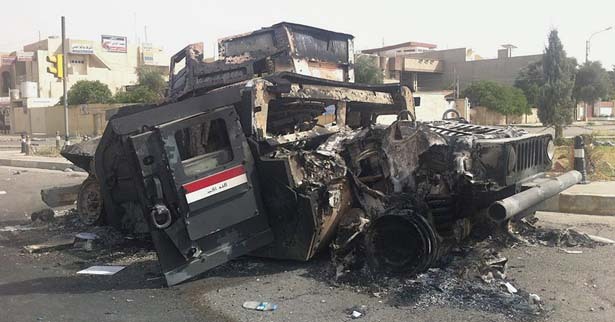 An Iraqi army armored vehicle burned on a street in the city of Mosul, June 12, 2014 (AP). The stunning military advance into cities in northern and central Iraq by an Al Qaeda offshoot, the Islamic State of Iraq and Syria—backed by some of Iraq’s Sunni tribal paramilitary forces and a militia tied to remnants of the deposed Baath party—compounds Iraq’s long-running tragedy. For thirty-four years—through the Iran-Iraq War (1980–88), the Gulf War (1990–91), the brutal US-led sanctions against Iraq (1990–2003) and the devastation that followed the US invasion in 2003—Iraq’s people have suffered unspeakably. Now the ISIS-led offensive is adding to that suffering. In seizing Falluja, Mosul and a string of other cities, ISIS has left devastation and mass executions in its wake, and it is aggressively provoking a revival of the Sunni-versus-Shiite civil war that left thousands dead between 2005 and 2008. But American military involvement in the latest eruption in Iraq, reportedly under consideration by President Obama, would be the wrong response to that suffering, morally and strategically. Even if limited to airstrikes, whether from F-16s, cruise missiles or drones, military action by Washington would almost certainly kill civilians, especially since ISIS is concentrated in heavily populated cities. Worse, such action would inflame, not ease, Iraq’s sectarian divisions, allying Washington more closely with Prime Minister Nuri Kamal al-Maliki’s monumentally corrupt and sectarian regime and against a seething Sunni population, and would send recruits streaming into ISIS’s camp. President Obama has hinted that he’ll make any US military support conditional on a change in Maliki’s sectarian style of governance. Since taking office, Maliki has excluded Sunnis from power—dismantling the Sunni tribal militia of the Anbar Awakening, accusing leading Sunni politicians of “terrorism,” creating security and intelligence machinery that reports only to him, and installing pet generals throughout an army so corrupt and incompetent that it simply fled at the start of the ISIS offensive. But if the United States couldn’t persuade Maliki to change his spots when it had some 150,000 troops in-country and advisers in every ministry, it certainly can’t do so long-distance. Despite eight years of blood and treasure lost in the Iraqi quagmire after 2003, the United States has precious little leverage left. First, of course, the Iraq civil war is the direct result of the Bush administration’s criminal decision in 2003, illegal under international law, to attack a country that was not involved in 9/11, had no weapons of mass destruction and posed no threat to the United States. That invasion and the subsequent occupation destroyed Iraq’s central institutions, including the army, the police and the Baath party. In the fight to fill the resulting power vacuum, Iraqis separated into Shiite, Kurdish and Sunni camps, a trend fostered by US occupation authorities. The countless dead left on the streets of Iraq’s cities, then and now, are on George W. Bush’s head. Second, the decision to withdraw entirely from Iraq in 2011 was signed in Baghdad by President Bush himself in 2008, as the price for that year’s Status of Forces Agreement. On taking office, Obama tried to undo that decision. He pressured Maliki to allow a sizable contingent of US troops to remain in Iraq past 2011, but those negotiations failed. Ostensibly, they failed because of sticking points like Washington’s demand that Iraq extend legal immunity to US troops, which Iraq felt was a violation of its sovereignty. But the talks actually collapsed because Iraq didn’t want US troops to stay. Not only did many Sunnis—who might have favored the United States as a stabilizing presence—argue that America was an occupying power; the government installed by Bush & Co., heavily weighted toward sectarian Shiites with close ties to Iran, didn’t want the United States to stay either. That’s partly because Iran, which has enormous influence in Baghdad, didn’t want any US role in Iraq, and made its wishes clear to Maliki in no uncertain terms. So, short of toppling Maliki, the United States was out. But if Obama isn’t to blame for the US withdrawal from Iraq, there is one important way the president is responsible for making the crisis worse: by fanning the flames of civil war in Syria. Washington opposes ISIS in Iraq but supports the armed opposition to Syrian dictator Bashar al-Assad, which includes that selfsame ISIS along with many other Islamist militias, including the Nusra Front, an Al Qaeda ally. By arming and training Syrian fighters (mostly through proxies like Saudi Arabia and Qatar), the Obama administration helped create space in Syria for ISIS to grow. Although Al Qaeda broke with ISIS because the latter was too indiscriminately violent, ISIS grew more powerful in northern and eastern Syria with funding from wealthy private sources in the Gulf states. It erased much of the Syria-Iraq border, built camps in Anbar and seized Falluja in January. In essence, the wars in Syria and Iraq have merged into one. The best step Obama can take now is to back off in Syria, ending support for the rebels there and seeking to work with Iran, Saudi Arabia, Turkey and Russia in search of a regional political solution. Rather than compound the suffering with more American missiles, Obama should provide humanitarian relief for the estimated half-million refugees who have fled the ISIS offensive. The region is already buckling under the strain of what has become the world’s worst humanitarian crisis because of the Syrian war, which nearly 3 million have fled, with more than twice that number internally displaced. The most constructive action from Washington would be to send food, clothing, shelter and medicine to relieve the suffering. In some ways, the conflicts in Iraq and Syria are proxy wars that pit Saudi Arabia against Iran, and have plunged the region into a sectarian rivalry, with Riyadh and Tehran backing Sunnis and Shiites, respectively. So the next thing Obama ought to do—rather than bomb Iraq—is to encourage a Saudi-Iranian rapprochement. In recent months, Iran and Saudi Arabia have tentatively sought to reconcile, and the ISIS scare could drive them closer together. Iran is of course bitterly opposed to ISIS and doesn’t want it to disturb its client in Baghdad (indeed, after ISIS seized Mosul, Gen. Qassim Suleimani, head of Iran’s Quds force, offered Tehran’s assistance, and it seems certain that Iran is supporting some of the many Shiite militias mobilizing to battle ISIS). And while Saudi Arabia supports sectarian Sunni movements around the world, it considers ISIS, Al Qaeda and the like beyond the pale. Iranian president Hassan Rouhani has reached out to Saudi Arabia, Turkey and the Gulf states. A Saudi-Iranian accord could vastly ease the crises in Syria and Iraq, nudging the leaders in Damascus and Baghdad toward a more open, accommodating stance. Iran and Saudi Arabia could work with Turkey in both countries, too. If Obama believes the rhetoric of his recent West Point speech favoring diplomacy over military action, he’ll invest his energy—and that of Secretary of State John Kerry and Vice President Joe Biden—in precisely that tall diplomatic task.